Heat the oven to 375°F. Spray a 3-quart shallow baking dish with vegetable cooking spray. 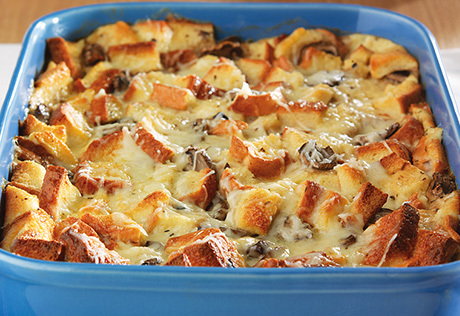 Place the bread and mushrooms into the prepared baking dish. Beat the soup, eggs, milk, thyme and black pepper in a medium bowl with a fork or whisk. Pour the soup mixture over the bread and mushrooms, pressing down the bread to coat. Let stand for 30 minutes. Bake for 35 minutes. Sprinkle evenly with the cheese. Bake for 10 minutes or until the cheese is melted.